The final rites of Srima Dissanayake, wife of the late Minister Gamini Dissanayake, will take place today at 3 p.m. at the Borella General Cemetery.Srima Dissanayake passed away at a private hospital in Colombo on Friday at the age of 77. 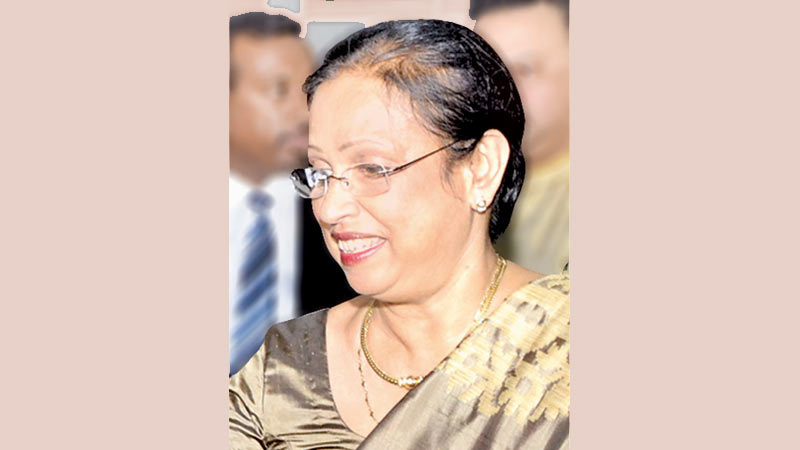 Mrs. Dissanayake, a lawyer by profession became the UNP candidate at the 1994 Presidential Election, subsequent to the assassination of her husband Gamini Dissanayake, who was the Presidential Candidate. Mrs. Dissanayake was a mother of two sons, Minister Navin Dissanayake and MP Mayantha Dissanayake and daughter Varuni Dissanayake. Her mains are lying at No.6/1, Wijerama Mawatha, Colombo 7. Cortege leaves residence at 2 p.m. today.